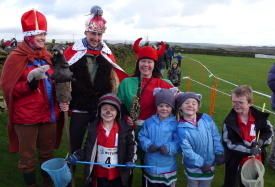 Photo: King Rat Mike Ayres was joined by his Queen, the Pied Piper who led the juniors to the Start, and some little rat-catchers! Paul's photos: Senior race, Quarry Rat Runs junior races. Dave's photos: Senior race, Quarry Rat Runs junior races. From Tom Addison ... We set off through the wet and slippery quarry all battling for our positions. I managed to get to the front along side my cousin Mark Addison, I deliberately pushed on down the stoney track and up the first climb towards the trigpoint. By the top I had managed to open up a gap of about 20 seconds on the rest of the field. Going along the skyline I felt quite strong and was still trying to push on and increase the gap. It was at this point where I cocked up up and turned off towards the ruins too early and ended up leading Mark and Graham Pearce through all the rough tussocks and heather. I knew that I had turned off well too early and was now finding it hard to keep any sort of rhythm going and was tripping over a lot which was frustrating, and all the time Mark and Graham were closing the gap. I then saw Steve Oldfield and Andy Wrench in front who had picked up the correct path and were nearly at the paving slabs. I raced towards where they had come from and managed to get on the correct path. By now I was feeling quite tired from all the rough and uneven running and was frustrated with myself from going wrong. From then on it was just a case of trying to catch Steve and Andy and regain my lead as well as trying to hold off Mark and Graham who were now right on my tail. It was just before the Bronte Bridge crossing where I managed to catch Andy who was leading. The last couple of miles were torture as the ground was so wet and strength sapping but I knew I had to keep up the pace to ensure the chasing pack could'nt catch me. But I was delighted to win in the end and was relieved that my mistake didn't cost me the race. Click here for a Google Map of the Senior course. Read all about them in the Spring 2009 Fellrunner magazine article here. Sunday 26th October. CS. Venue as above, starts from 10.30. �1 entry on the day only. U8 (over 6) 0.5m/100'; U10/12/14 1m/150'; U16 2m/300'. See the Quarry Runs page for records. This year the Quarry Runs at the Withins Skyline race takes on a new guise, as the Curly Wurly Rat Runs. Abbey Runner Mike Ayres is so taken with the whole ethos of the Quarry Runs he has decided to sponsor one of the races. 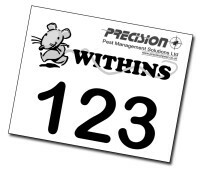 Mike runs Precision Pest Management Solutions Limited, and initially was wanting a 'little nipper' (mouse trap) in each of the goody bags, however on reflection, and due to Health and Safety ('little nippers' for the little nippers wasn't a good idea!) a compromise has been found and each goody bag will now include a sugar candy mouse, along with a Curly Wurly, a bag of crunchy crisps, a yummy lollie, chewy chews and of course a carton of pop to wash it down with. Just what everyone wants for finishing a race. And, new in 2008, a certificate to congratulate you as a Ratty Runner! You'll also see World Downhill Mountain bike champion Karen Ballantine dressed as the 'pied piper of Penistone Hill', to lead you all in to the quarry to the start line. There are prizes for the best fancy dress - including a blow up eyeball and box of Roses to the first 3 boys and first 3 girls - judging of this will be by King Rat 'Mike Ayers' on the start line. Curly Wurly Rat Run race prizes of chocolate or toffee apples go to the first 3 boys and first 3 girls in U8, U10, U12, U14 & U16 age groups. A bonus for the race winners is a yucky squeezable skull � eyeballs and bugs come out their eye sockets! There is also a free prize draw to all junior runners who compete with the prizes being a Coffin of gruesome gummy body parts, a Cadbury's chocolate bag & a skull doorbell! Finally don't forget after the prize giving it's the 'famouse' chocolate throw out. King Rat (Mike Ayres) has chewed over all the fantastic entries and here are the winners! Tube of Skittles for entering go to Emma Spencer, Molly Holder, Annie Roberts & Chelsey Holder gets 2 tubes for 2 entries.